The QuiXSLT language is a large fragment of XSLT 3.0. 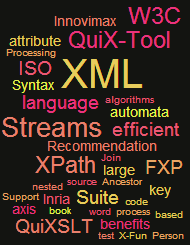 The QuiXSLT library provides a compiler from QuiXSLT to X-Fun, a functional language for hyperstreaming XSLT. Both, a free demonstration and a professional version are available. Hyperstreaming model: shred the output stream into fragments that can be produced independently in parallel. Flip of document pairs are hyperstreamable but not streamable. No trainning: in memory and streams implementation use the same XSLT syntaxe. Support, in streaming mode, a bigger fragment than streaming support for XSLT 3.0. Good efﬁciency compare to Saxon XSLT implementation. Which fragment of XSLT is currently supported by QuiXSLT? Templates can be called with any number of parameters.